The first date is more sensitive than the subsequent dates. You hardly know what will make your partner happy or annoy them. It is even more sensitive if you have only met your partner online. Women need to choose their dresses with caution on this first occasion to avoid making the wrong impression. According to studies, colors send a strong message, particularly on matters related to love. With a full understanding of what different colors mean, you can boldly choose the appropriate color to wear on your first date through your dress and accessories. Not many women will choose white for their first date. That is probably because they do not know how the date will unfold. However, it is a good color for a person who would like to show the purity of their bodies and overall cleanliness. Ladies who wear white also depict how organized they are, even at home. If you want to send such a message on your first date, then choose this color. This color is an excellent one to show how truthful you will be if the date gives positive results. It is a no-brainer that blue is a masculine color that depicts boldness. For the first date, the best thing to use it in is your accessories or give a little touch on your dress. It is a no-brainer that red is the center of love in a relationship. But a woman who has the courage to express their feelings using red on the first date knows what they want. It is easy to use red if you have met your man on https://www.happymatches.com/ and have been communicating and known a little about each other. Thus, you can do a red dress and accessorize yourself accordingly. A woman who chooses to wear black for the first date shows how bold and confident she is. This is a color that is known to have controversial meaning including grief when used on some occasions. But for your date, it is a positive color that shows class and elegance. Whether you choose a black dress or accessories, your first date will be excellent and full of joy. Needless to say, men respect women who are bold and classy. Whether you choose to wear full pink or just accessorize, this color will bring a meaning of casualness. 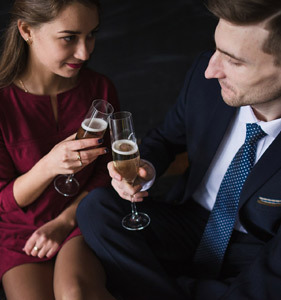 Although it is not recommended for the first date to avoid making a casual impression, you can make this decision if you already know the theme of the date. Men who are not so formal can choose a bar setup or a picnic out for your first date. In this case, this is the best color you can grace this special occasion with. By now, you already know what different colors mean when used during the first date. The choice now depends on the message that you want to send. Mixing colors with different meanings can be confusing, especially to a man who already knows what they mean. You have to make one color dominate the date.